Are you ever nervous going outside with wet hair? Personally, I can’t stand even going around my house with wet hair when it’s cold. Normally, I have to deal with it, however, since I can’t stand my current hair dryer. While it was okay when I first purchased it years ago, it now is more likely to fry my poor fine hair since it has a hard time regulating heat. When I first bought it, I loved the idea of having a ‘cold air’ setting, until I saw it was a ‘burst’ thing that only worked half the time. To say the least, I have tried making that hairdryer work since I couldn’t figure out what I needed and really wanted something that would look long term and more environmentally friendly than my hair frying, piece of junk hairdryer. BARBAR Professional ECO 8000 Blow Dryer: What is It? Looking for an ecofriendly hairdryer that really works? If so, we think you will love the BARBAR Professional ECO 8000 Blow Dryer. This hair dryer emits a mere 4.1 mG (standards emit 200 mG) and saves 40% more electricity than a standard hair dryer. Not only is it eco-friendly and safer, but it is powerful, producing heat and airflow that cuts drying time in half, giving you results you would expect from an expert. As well, it offers multiple heat and speed settings, including a cool shot release button. Along with being lightweight (only 1.3 lbs), it also includes air concentration nozzles for precision styling. Once you have tried this awesome hair dryer, you will see why fashion experts love the BARBAR Professional ECO 8000 Blow Dryer! Okay, I’m a bit embarrassed to admit this but I think I have fallen in love with my hairdryer. For the first time in my life I have a hair dryer that dries in my hair in less than five minutes and doesn’t leave my poor hair looking burned or frizzed. Before getting the BARBAR Professional ECO 8000 Blow Dryer, I thought all hair dryers were the same – now I know better. Like many things in life, you get exactly what you pay for and to me, this hair dryer is worth every penny! What I love the most about this hair dryer though would have to be the heat settings. I have it blow nearly cold or lukewarm hair that doesn’t fry my hair and still dries it in minutes. Really, I don’t think I can recommend it enough. Based on my own experience, I am delighted to give the BARBAR Professional ECO 8000 Blow Dryer an A+ rating. 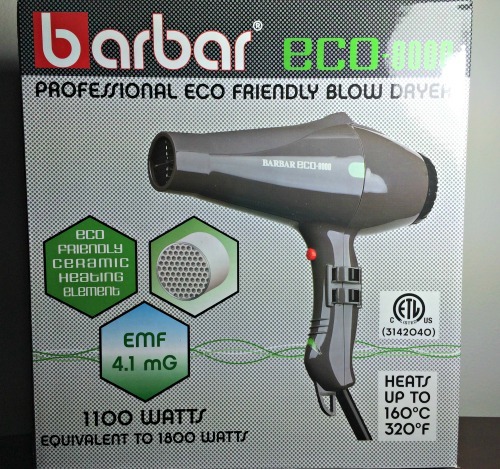 BARBAR Professional ECO 8000 Blow Dryer: Where to Purchase? Just as a heads up, this discount code expires on March 1, 2015 so don’t put off buying it too long everyone! 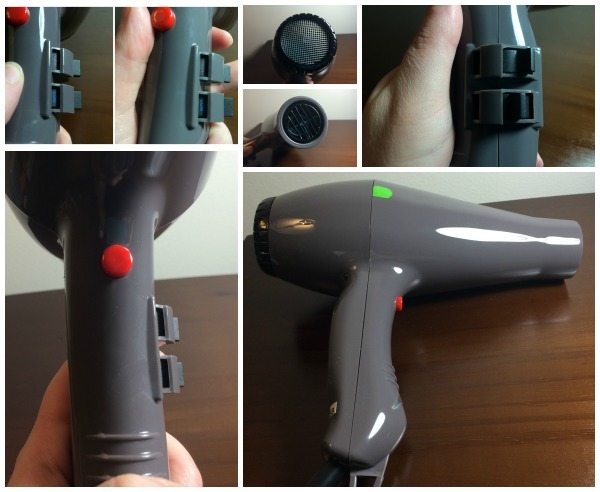 We want you be able to try this hairdryer for yourself and see why I now adore this hairdryer! Want to learn more about their products? Check out Barbar on social media! I LOVE THIS BLOW DRYER! I would love to try it. I am very anxious to get this fabulous hair dryer. My hair is thin from chemo. This dryer has all the features I need ie eco friendly ,settings, light weight and no more frizzies, and an A+ rating. I would really like to try this hair dryer.I have very dry,curly hair and the cool/warm setting really appeals to me. This is wonderful I’d love to have an eco friendly blow drier esp now that my hair is finally getting longer. Great deal! This blow drier is awesome!!! I hope that I win because I would love to have one!!! Thanks for the opportunity!! This blow drier looks to be very hardy!!! Love that it saves on electricity but still dries your hair very quickly. Really hope that I can get one!! Wow! this looks like an awesome blow dryer and I really need a blow dryer. Love the fact that it is so eco friendly! I love the fact that it won’t make your hair all frizzy!!! I would really love to have a Blow Dryer that dries fast without frying my hair! I usually just dry my bangs rather than my long hair before I go to work because I don’t want to damage my hair blowdrying it every day. This looks like an amazing blow dryer. I have always wondered the difference between the ones we buy out of the stores and the professional ones. Wow, this dryer seems awesome. I could use a lightweight dryer because my shoulder hurts whe I dry my hair. Also, cutting mt drying time in half, priceless!! Sounds like I need this! I am glad that it is eco friendly. Being on the go all the time I need a dryer that dries fast. Thanks for the review! I love this hair dryer! It would be perfect for my daughter and granddaughter. I really enjoyed watching your clip above and learned a lot. I couldn’t believe the other hair dryers and microwave overloaded the emf reader. I also really like that the Barbar hair dryer saves you about 40% more on electricity. I love the fact that it dries hair so fast!! !Plus my hair is delicate and regular hair dryers make it look frizzy/dry.Thank you for this review. i love that the hair dryer has heat settings which alows the hair to dry faster and is very good for the hair too. It’s a bit more than I can afford for a hair dryer but sounds like a nice one. The damage was so severe that my hair started to break off and every time I washed my hair more and more was going down the drain, and yes I’ve had to use draino max several time just to unclog my tub. My hair became so thin you could eventually see through it. My hair at the time was past my shoulders. I had to do the thing that no one who is growing out their hair wants to hear. “I was forced to CUT MY HAIR SHORT!” I was almost in tears when the hair dress gave me the hand held mirror to take a look at the back of my hair. My hair was so short! but she had to cut it pretty short to even out my hair according to where my breakage was. I have just now posted a new Facebook picture. And can you believe that my hair length in that picture is 6 months worth of growth? You can only image how short she had to cut it, unfortunately I did not take a picture when it was so short because I was so embarrassed. I would not go out into public for two months. I don’t care what anybody say’s even makeup didn’t help! That didn’t make my hair any longer. A woman’s hair is her identity! And once you loose that no matter what anyone says to you, no mater how many times they say you look beautiful, it just doesn’t matter. I had lost my hair. It has grown about 2-3 inches since I had to cut it and I am getting out more socially. I have read the reviews on the Barbar Professional Eco 8000 Hair Blow Dryer and I too am impressed. I am currently using an 8 year old hair blow dryer that does not have half the features of the Barbar Professional Eco 8000 hair blow dryer. I guess I got a little emotional about the subject. I intended to leave a short and sweet post asking you for the chance to win the Barbar Professional Eco 8000 hair blower dryer. I would greatly appreciate the opportunity to own the Barbar hair blow dryer.Thanks for reading my post. *hugs Kelly* Us ladies take our hair seriously and it can be a blow to our self confidence. You are always welcome to say your feeling here. This blow dryer really was a great experience for me since my hair is naturally very fine and burns easy. My mom had very similar issues to you with dying her hair her whole life and ironing it since it to manage her natural curls. It did a lot of damage but did eventually get better. Thanks for the hugs! And you are right and my hair is slowly getting better. I have really long hair, it takes so long to dry it. Would love to dry my hair in 5 mins. That Barbar hair dryer is just what I need. Drying done in five minutes, and less power used. You need say no more! I have long hair, like it straight with no frizz. I guess the higher price ticket is worth it for better hair. Thanks you for the review. I see quality in your dryer, Mine just broke. I could really use this one! Wow!! That’s quite an endorsement! I appreciate the fact that this dryer is eco-friendly and that it dries your hair so quickly! I live in Vegas and HATE drying my hair in the summer—who wants to point hot air at your face and head when it’s 100+ degrees outside!! I will definitely be looking more closely at buying this one. Thanks for a great review! How amazing! It’s wonderful to know that there is a product that is worth every penny! I love the fact that it is light-weight and gets the job done in no time. This is a great review and looks like a great hair dryer. I am so picky with mine as I need it to really push the air out and also not be super heavy since it takes so long to dry my hair. I like that is is 1100watts but the force of 1800watts. This blow dryer is perfect for me and my wild hair. My hair needs a lot of help!! I would love to own this hair dryer. It saves 40% more electricity than a standard hair dryer, which is important to me. It is powerful too, producing heat and airflow that cuts drying time in half. And since I am older and do not have the strength in my hands that I used to have, it is lightweight. Yea. We would love to have this. Our blow dryer is broken and we had to throw it away. This would be perfect. You review really makes me want this! I love the sleek design and the weight of this. The dryer I have now is old and heavy and gets hot really fast. This is definitely going on my wish list. This blow dryer seems like a real nice dryer. I think I found my new hair dryer. We go through many hairdryers in this house. This sounds like a really good one, thanks for the review. I would like to replace the hair dryer I have. I gave my daughter the hair dryer I had and am using the one that was my moms. That is amazing how fast it dries your hair. I would love to not have to blow dry my hair dry for 15 minutes every day. It has got to be healthier for your hair as well. I use a blowdryer daily and end up usually frying my hair… I like the fact that this one worked well for you, using colder air but still dried quickly and it left you hair looking good, not dried out or frizzy! I love that it uses less electricity. And I love, Love, LOVE that your hair dries in less time. I spend so long every morning drying my hair, it takes forever! I didn’t know that a blow dryer could be eco-friendly. My hair takes so long to dry, I would probably save a lot on my electric bill with this dryer! This is a great review and looks like a great hair dryer. I love that it is lightweight and powerful. I also loves that it saves 40% more electricity than a standard hair dryer. This is a high quality blow dryer and the cheap ones are a waste of money! I love that this Dryer is Eco-friendly and saves power, but is more powerful that many other dryers – certainly more powerful than my old dryer. I would love,to own it. I like that blow dryer uses less electricity than a standard one. This blow dryer and its different heat settings sound really nice because the blow dryer I have now leaves my hair very frizzy. This blow dryer looks very nice. Thanks for sharing!